The long awaited Electronic Music Awards, originally slated for 2016, are finally just around the corner – and we couldn’t be more intrigued for what’s to come: the celebration of musical tastemakers, creatives, executives and entertainment visionaries across eleven awards. Taking place in the heart of Downtown Los Angeles at the Willow Studios, the fabled Electronic Music Awards are slated for Thursday, September 21st from 7:30 to 10:30 PST. For your chance to join the fun, RSVP here.Simultaneously live streamed through SiriusXM and Twitter, the Electronic Music Awards is not your mother’s award show: like all things with dance music, it’s a party! There’s no sitting on the dancefloor – in fact, this a dancing room only affair featuring no long winded acceptance speeches, and no breaks – except for when they’re accompanied by some funky beats, that will emanate from various corners of the venue. 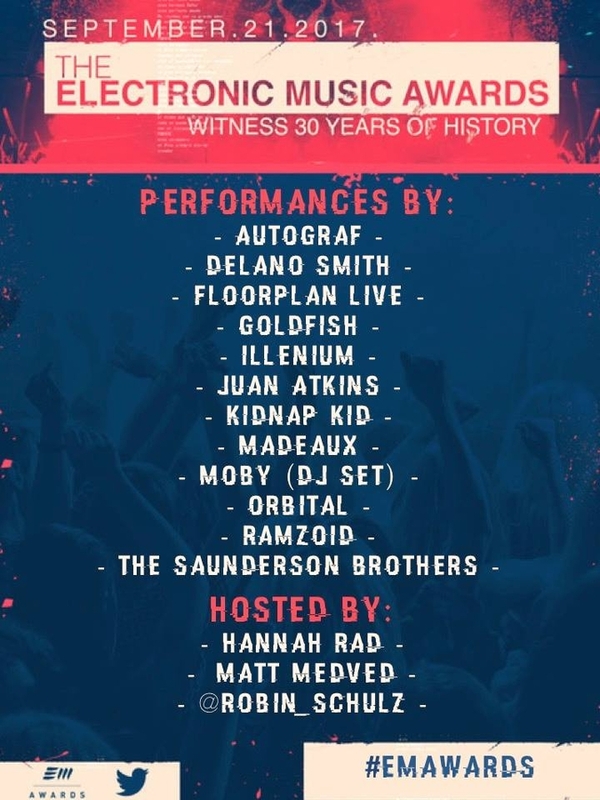 Paying homage to the industrial origins of techno music, the Electronic Music Awards will showcase the Detroit acts on the Detroit Dock, a unique outdoor space, with a DJ booth situated on a loading dock. Featuring multiple generations of Motor City’s artists, you’ll be able to catch genre godfather Juan Atkins, legendary DJ Delano Smith, Robert Hood performing as Floorplan (Live) and The Saunderson Brothers, are carrying the torch for their father Kevin Saunderson and a new generation of Detroit artists.Other notable performances for the evening include the first US performance from the UK based OG’s Orbital, Moby, Autograf, Kidnap Kid, Madeaux, Gold Fish and so many more. However, a few formative questions still remain: with the amount of commercialism pumped into the industry in the last few years, exactly what facets of dance music will be hitting syndicated television, how much homage will the underground dance culture, community and artists behind it be paid and how will underrepresented demographics like women and minorities within dance music be displayed? one look at the artist list and you’ll realize that there aren’t any female performers slated for the evening, so, will there be any female award winners – or at least any females in the running?